In this week’s installment of Rare Books and Special Collection‘s blog series on B.C. place names from the Irving K. Barber Learning Centre, we’ll take a close look at the Fraser River. The Fraser River is, not surprisingly, named after the explorer Simon Fraser who fully explored the river in 1808. The longest river in British Columbia (over 2,200 km), it originates in the Rocky Mountains and flows into the Straight of Georgia. Gold was struck in Fraser River around 1858 which is the origin of our featured document. 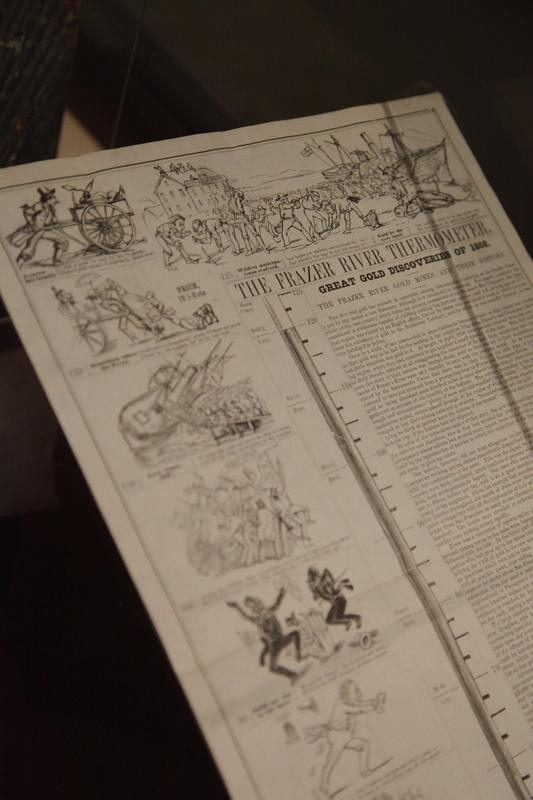 This broadside entitled The Frazer River Thermometer was published in San Fransisco in 1858 and has humorous illustrations of miners leaving their lives and families in California to seek gold in British Columbia, describing the area as the “new El Dorado of the North.” Note the older spelling of “Fraser” with a “z” instead of an “s.” Very few copies of this document are known to exist, but we have one copy on display in the Chung Collection exhibition room, and another which is available upon request in our reading room for closer consultation. Early B.C. history is one of the main focuses of the Chung Collection, along with immigration and settlement, and the Canadian Pacific Railway Company. The exhibition displays highlights from the collection, but the collection is much larger, numbering approximately 25,000 items. In the Barber Centre, the Fraser River room is part of the facilities of the Centre for Teaching and Learning Technology, on the 2nd floor.